This is the introductory post to a collaborative series titled “Environmental Historians Debate: Can Nuclear Power Solve Climate Change?” hosted by the Network in Canadian History & Environment, the Historical Climatology and ActiveHistory.ca. Is nuclear power a saving grace – or the next step in humanity’s proverbial fall from grace? This series focuses on what environmental and energy historians can bring to discussions about nuclear power. It is a tripartite effort between Active History, the Climate History Network (CHN), and the Network in Canadian History and Environment (NiCHE), and will be cross-posted across all three platforms. Reflecting this hydra-headed approach, this series is co-edited by a member of each of those websites: Jim Clifford (Active History), Dagomar Degroot (CHN/HistoricalClimatology.com), and Daniel Macfarlane (NiCHE). Why a series on historians, nuclear power, and the future? After all, predicting the future is pretty much a fool’s errand, and one that historians tend to avoid. But this isn’t so much about prognosticating what is to come as using the knowledge and wisdom of history to inform dialogue about the present and future. It all started on Twitter, as these things often do. Daniel Macfarlane was tweeting back and forth with Sean Kheraj about some energy history books they had recently read. Daniel was lamenting that one ended with an arrogant screed about how nuclear energy was the only hope for the future, and anyone who didn’t think so was deluded. 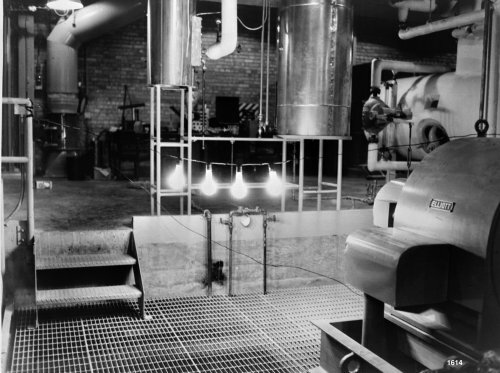 This led them to wonder – on Twitter, mind you – what environmental historians, and those who studied energy history in particular, thought of nuclear energy’s prospects. Some other scholars, many of whom will be represented in this series (Dagomar Degroot, Andrew Watson, Nancy Langston, Robynne Mellor), began chiming in online. The exchanges remained very collegial, but it was clear that there were some sharply diverging positions. This mirrored the stark divides one often finds among environmentalists and environmental studies students. To some, nuclear energy is just another dead end, like fossil fuels; to others, it offers humanity its only real hope of addressing climate change. The three editors of this series themselves project differently across a spectrum running from anti-nuclear to pro-nuclear, with an in-between that might best be called anti-anti-nuclear. Daniel Macfarlane is decidedly a nuclear pessimist, Dagomar Degroot sees an enduring role for nuclear fission on a limited scale, and Jim Clifford is not sure how to engage the nuclear debate within the context of continued inaction on carbon emissions. Each of the three will explain their basic positions below (in the first-person voice for the sake of coherence). Daniel Macfarlane: In my opinion, any energy and economic system that continues to foster our consumption and lifestyles are part of the problem. As Nancy Langston will show in this series, nuclear power is undoubtedly better than coal. But the belief that we can continue with the same standards of living are dangerous – the addiction to growth and consumption is the major driver of ecological problems (I’m firmly in the Prophet, rather than the Wizard, camp, a dyad which Andrew Watson will explicate in his contribution to this series). And nuclear energy fosters that addiction, on top of the threats from nuclear waste (which Robynne Mellor will discuss), nuclear fallout (the focus of Toshihiro Higuchi’s contribution), and nuclear accidents (which Kate Brown will address). I don’t think fully switching to nuclear power would solve our climate change problems. Nuclear power isn’t likely to stop us from driving cars and flying jets; from covering the earth in concrete, overconsuming meat, and having children. The only real energy solution is a drastic, huge reduction in energy consumption, primarily by the industrial and commercial sectors as well as those of us in the middle class and above within the “developed” world. Nuclear power is a panacea, a magical silver bullet that will allow us to have our cake and eat it too (in this case, I literally mean cake, as well as all the other consumer products we want). It would mean that we wouldn’t have to change our lifestyles. In that sense, switching to nuclear power is kind of the energy systems equivalent of banning plastic straws. If it is the first step in a long, long line of progressively harder steps, then great; but if it becomes the end in itself, a panacea that leads us to think that we’re doing enough and we can rest on our laurels, then it is an obstacle (for the record, I use metal straws – but getting rid of plastics straws alone isn’t going to make a noticeable dent in our plastics problem). The problem is our current systems – economic, political, and social – and nuclear energy is just going to prop up the problem. Today’s nuclear advocates sound an awful lot to me like the advocates of coal, petroleum, and hydropower from the past that I’ve researched – whose ranks often featured well-intentioned, educated, progressive, and preservationist-inclined folks. The history of energy transitions suggests that proponents and boosters of new energy forms are generally wrong about the hidden costs – why would nuclear be any different? Historians of all people should know about humanity’s propensity to irrationally stress the positives and downplay the negatives. If all of our other modern energy forms have been booby-trapped with major drawbacks once scaled up, why would nuclear be free of similar problems? I’m wary of any large-scale energy systems because of the rule of unintended consequences. I mean, when we started burning coal in the 19th century, who the heck thought that it could change the climate?! Who thought that hydropower reservoirs would concentrate mercury and emit methane? And none of these things are capable of being used as weapons of unimaginable mass destruction, or when decaying are hazardous to the health of living organisms for eons. All technologies bite back, and the bigger the technological system, the bigger the bite. Dagomar Degroot: I’ll begin by admitting that I’m deeply sympathetic to Daniel’s point of view. Clearly, efforts should be made on every level – individual, municipal, national – to conserve energy and reduce consumption. Yet I am more skeptical than Daniel about the desirability, morality, and practicality of slashing our use of energy, and in turn our standards of living. My view is that most of our environmental challenges stem from inefficient and often immoral political and economic systems: systems that promote inequality and ignore environmental costs. Engines of consumption and exploitation that privilege the whims of the privileged over the needs of the majority now promote the wholesale destruction of tropical forests, the exhaustion of the oceans, the pollution of the atmosphere – all the myriad interconnected environmental perils of the Anthropocene. In these processes, the core problem is not precisely how much energy we use as a species, but rather how we generate energy and then how we use it for industry, agriculture, and transportation. Today, governments choose to promote fossil fuels over cleaner alternatives, not only because industries that produce fossil fuels have disproportionate political power, but also because our built environment – from cars to sprawling cities – has historically reflected and demanded the use of fossil fuel technologies. It doesn’t have to be this way. What we need are revolutionary policies and technologies that lead us to use energy more efficiently, to build with minimal carbon emissions, to generate energy cleanly, to promote social equality, and to privilege – above all else – environmental sustainability. Even in the developed world, policies that sharply reduce standards of living are to my mind unnecessary, even if they were politically viable (they aren’t). In the developing world, energy consumption will actually need to go up, lest millions remain consigned to desperate poverty. An important question for me is: how can we increase our consumption of energy while sharply reducing the environmental impact of energy consumption? Renewable energy is booming, and nuclear fission reactors are a far less appealing energy source than, for example, solar power plants or wind farms. If truly transformative technologies – such as controlled fusion – ever get off the ground, nuclear fission will be even less competitive. Fission reactors are costly and time-consuming to build, and some designs at least have turned out to be unsafe. As you will read, they also come with a host of unique problems. Yet at present, renewable energy alternatives cannot generate power on sufficient scales – with sufficient consistency – for every community. In all probability, we will need to construct new nuclear fission plants in order to reduce our carbon emissions quickly enough to avert truly catastrophic climate change. And we should be especially wary of decommissioning older nuclear fission reactors. Given the present limitations of renewable energy, those reactors are too often replaced by coal or natural gas. Yes, an enduring role for nuclear fission power is an unsavory prospect. But climate change on a scale that makes large parts of the Earth uninhabitable is considerably worse. Jim Clifford: I find a lot to agree with in both Daniel and Dagomar’s contributions. I will use my space to build on Dagomar’s quip that political, social and economic change on the scale necessary to dramatically reduce global energy consumption during the 2020s is not possible. As a historian who has studied social and political change in the face of deep environmental challenges during the nineteenth century and who has taught early twentieth-century European history for the past six years, I think the socio-economic and cultural optimism of the Prophets is perhaps more unrealistic than the techno-optimism camp. Wizards and engineers can point to significant developments in the electrification of transportation, the various ways to dramatically increase solar and wind capture and storage, along with the plans for saltwater biofuels and promising new nuclear technologies. What evidence do we have of rapid progress towards an empowered grassroots democracy that suggests we can upend our culture and convince people to accept a significant reduction in their standards of living in the next decade? The riots in France are in part a reaction to a relatively minor effort to reduce people’s diesel fuel consumption; the Ontario Liberals’ tepid embrace of green energy helped bring a populist into office to dismantle much of what they accomplished; Australia has yet another prime minister after a government collapsed for trying to bring about small changes; and Justin “Canada is back” Trudeau bought a pipeline. So how do we achieve social, political, and cultural change on a global scale in a very short period of time? Individuals electing not to fly, having fewer children, or biking to work are not going to make a significant dent. We need societal change across the industrialized west. How in a democracy do we achieve this goal? I don’t see the power of the wealthy elite diminishing significantly or somehow transitioning away from capitalism on a global scale while maintaining enough stability to rapidly transition to a lower standard of living in a peaceful manner. We might end up with a global war that could devastate the global economy and our standard of living, but obviously, this is not the pathway we want to follow to solve the crisis, as it would just accelerate ecological destruction and human suffering. All of this is to say, when presented with the binary, I think the techno-optimism and the growing momentum for a Green New Deal to build this infrastructure, create jobs, and maintain middle-class standards of living is the most viable path in the short to medium term. I hope our culture will start to quickly shift in response to the populist moment we are living through and we can aim for a hybrid between the two approaches in the mid-century when fear sets in and the generation who come of age watching California burn reject the culture of their parents and grandparents. And we need Prophets to imagine a transition away from today’s consumption focused culture and to provide alternatives for people to embrace at some point in the future. In the meantime, if there is the local political will to invest billions of dollars in a few more nuclear energy plants, I don’t expect this will go very far to solve the problem or create a dramatic increase in the scale of the environmental risk our children face. Our various contributors fall somewhere on this spectrum. We have purposefully sought out scholars with various viewpoints, and attempted to have a diverse set of contributors. Below is the schedule for our first five posts, which have already been written. However, we are leaving the series open-ended – that is, we hope the posts will spark conversations and debates, and should any reader feel inclined to contribute their own post in response to the series, we are open to the possibility of adding more posts.